Shop our range of EMU Australia 100% real Australian sheepskin and leather shoes and boots for teens and tweens here. Our range for girls and boys offers classic sheepskin boot styles as well as boots with a small heel, moccasin style slippers and sneakers with espadrille soles. EMU Australia shoes and boots for teens come in classic colors such as black, tan and brown, as well as seasonal colors like burgundy, navy and pink. 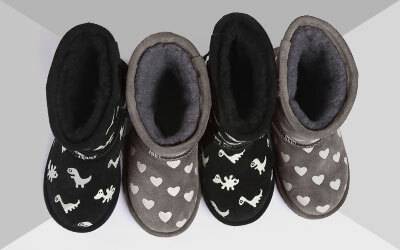 We have an amazing range of 100% real Australian sheepskin shoes and boots for teens and tweens here at EMU Australia. With so many trendy and fashionable styles teens will love, they’re sure to find a style to suit them. We have lots of styles ideal for school or college, such as biker and chelsea style boots with fashion first details like edgy buckles and cool lace ups. Or perhaps the teen in your life is looking for something casual for the weekend. Check out our sneakers and moccasins with espadrille bottoms and leather uppers, either in slip on style or lace up, featuring textile and cotton mix uppers. They make an ideal addition to any teenagers summer wardrobe. But they also have a gum rubber sole, so they’re great for wearing day to day whatever the weather. Another great casual option are our classic sheepskin boots, in either classic height or ankle height. They’re trendy, fashionable and stylish so teenagers are sure to love them, but they’re also super practical, since our natural and authentic Australian sheepskin, suede and leather is water resistant, and many of our shoes and boot are completely waterproof. They’re lined with soft, warm and cozy Australian merino wool, so feet are guaranteed to stay toasty in colder climes. But out 100% natural Australian sheepskin is also really breathable, meaning it wicks away moisture to leave feet cool and dry, so they can also be worn in warmer temperatures during the summer, and since they’re water resistant they’re ideal for summer drizzle and showers.